Since my first litter in 1993, my goal has been to maintain the natural characteristics that have made the Malinois a top dog internationally for service, sport, and companion. As of 2008 I am now working my third generation of females that I bred and fifth generation of dogs that I have owned. I have owned Belgian Shepherds since 1979, and from 1984, the Malinois. 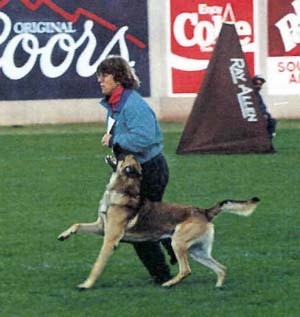 From a beginning with AKC obedience, tracking and herding, I became interested in internationally recognized protection-dog sports, schutzhund/IPO, and now, mondioring. From training and competing with my dogs both in the US and Europe, I became more knowledgeable of the Malinois as a working dog, its history and development as a performance breed. I am grateful to all the old-timers who gave me so much information and an education about the breed.